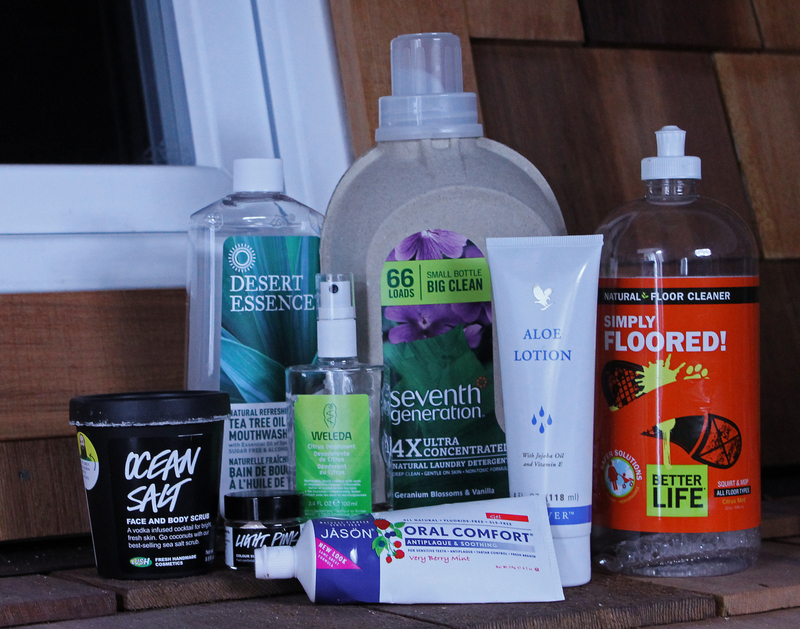 Products that are biodegradable and not tested on animals are very important to us. Protecting not only our environment but also our own health is something we think about every single day, and we strongly recommend others to do the same. Besides that, we are also lovers of simplicity which means we only buy what we really cannot live without. Luckily we live in an area with many health food stores. New Morning Market in Woodbury, CT is our favorite. It’s a little more expensive, but we can shop without worrying about what ends up in our shopping basket. This lotion has a very pleasant smell and also feels fantastic. It’s very moisturizing but not greasy and soaks right into your skin. I enjoy trying different hand lotions, but this is my current one. Hand Wash: Soaps from Goatboy or Bars from Lush Fresh Handmade Cosmetics. We try to buy local as often as possible, but we mostly have one big problem – there are always too many beautiful and nicely scented soaps to choose from! We regularly switch between the different scents but our ultimate favorite is Peppermint. Why? We love inhaling the oils during the shower and the tingling on our skin afterwards. The freshest and coolest looking peeling I have ever used. I mainly use it for my face, but sometimes I also apply it to my hands, just because I love how soft they feel afterwards. A natural spray with only six ingredients (alcohol, water, lemon peel oil, and three other obscure-sounding essential oils). I absolutely love the smell of fresh strawberries which lasts even hours after shaving! Aloe, Aloe, nothing but Aloe! I have used these two products for more than 10 years. This speaks for itself, doesn’t it? I love berries, Shawn loves mint… and so we love the very berry mint toothpaste from Jason! We try to vary what we use and so we also buy Whole Care from Tom’s of Maine or Toothy Tabs from Lush Fresh Handmade Cosmetics. The latter comes with a very special bonus – no plastic waste! Yes, even our dental floss is vegan and cruelty-free. I had to get used to the taste but it’s a fairly good mouthwash! A plant based, very gentle shampoo. Once this bottle is empty I will try washing my hair with baking soda and apple cider vinegar – can’t wait, wish me luck! Oh my gosh, what a heavenly smell. I can’t describe in words how obsessed I am with this conditioner. Unfortunately it’s very light so I have to apply a lot which is why I use it as a special treatment and not every day. A natural, light-weight color supplement that I mix with my face lotion whenever I feel like I want to even out my facial color. Vinegar is a multi-talent which even my German parents used when I grew up. I will have to test around a little bit more before I can make better suggestions. Does its job, although I have to use a lot to clean some really oily dishes. I can’t tell you how relieving it is to wash my clothes with a natural detergent. Why? Our skin is our body’s most important protection, right? It absorbs everything we touch like a sponge. So, if you wash your clothes with chemicals they will inevitably stick to your clothes, and now just imagine what is rubbing against your skin while you are working, relaxing, eating and sleeping… Yikes! I have just started using them. They work quite nicely, you can even compost them, but my clothes are still a little static when they come out of the dryer. However, since I prefer to hang dry all my clothes in the spring, summer and fall I don’t worry too much about this problem. I have used it only three times within the last year and the results were pretty disappointing to me. Well, I’m sure I did something wrong, most customer reviews praise this product. I’ll try again! It works fine, that’s all I care about. Some people complain about the smell but it’s really not that bad. By the way, Seventh Generation also offers Shower Cleaner, Toilet Cleaner (not that we will need it), Bathroom Tissues and so on. There’s not much to say about this product. It works, and guess what – one of the ingredients is vinegar! Works and makes the floor smell fresh and clean! Ok, you will probably think this is totally weird, but actually this product is absolutely fantastic. My only regret is that I have not stumbled upon it earlier. It’s a cup you reuse so you don’t produce any waste and, more importantly, you do not insert any chemicals into your body. I have to admit, it takes some practice, but the result is worth the patience! This is the only product I have not been able to replace yet, but I haven’t really looked for a natural replacement, to be honest. I use rigid gas permeable contact lenses which makes it harder to find the right solution.